A Totally Today dinnerware set may be hard to find, but pieces of the various discontinued patterns are still available through replacement companies and through second-hand sources. From time to time I see a full set for sale. If you are attracted to a certain pattern in the Totally Today brand, now is the time to look for it and purchase what you can find to ensure that a full set can be created. This trendy dinnerware was made in China. I haven't been able to find much info on the company that produced these awesome patterns, which makes me think that perhaps the company has shut down, or pulled the Totally Today brand. Because the dinnerware patterns are discontinued, running across a full set is a find if you find the pattern appealing. Otherwise, you can buy pieces when you find them available to make up a full set. There are also other patterns that carry the Totally Today brand including several embossed patterns, floral patterns, fruit patterns, pinecone patterns, palm tree patterns, banded patterns, two tone patterns, and solid colored dinnerware. Perhaps the most original pattern features flamingo birds and palm trees. I really like the pattern that features flowers, a hummingbird and butterflies. That is perfect for springtime dinnerware. The swirled patterns are also appealing and add some originally to the patterns. The Christmas dinnerware sets by Totally Today are great for Christmas décor and serving holiday dinners. I actually have some pieces from the Holly Tree pattern and I find the poinsettia pattern to be perfect for holiday serving. I view most of this dinnerware as casual dinnerware sets, decorative in nature; however, there are two patterns that had metallic trim in gold and silver for a fine dinnerware appearance. 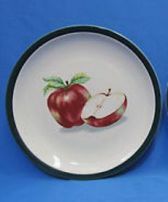 It seems that Totally Today was up on producing dinnerware that fit into the trends of the time they were produced. If you are into vintage décor, Totally Today is a brand to look into. 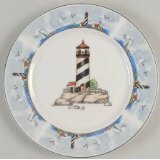 The lighthouse dinnerware pattern, the palm tree patterns, the apple pattern, and the swirled and embossed patterns lead me to that conclusion. The patterns are definitely decorative and will do well in complementing vintage décor.